UFC fighters are typically skating on very thin ice if they’ve dropped five of six scraps. Now, tack on a three-bout losing streak on the tail end of that skid and it’s almost a certainty they’ve entered pink slip city. Not for Scotty Jorgensen (pictured). 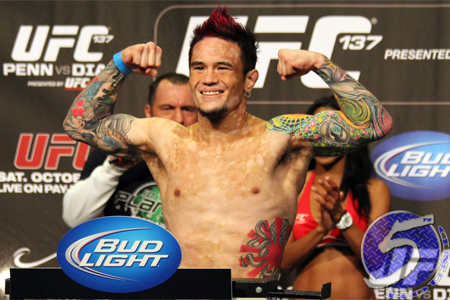 On Wednesday night, the UFC announced Jorgensen will be granted (at least) one more go in the octagon when he meets flyweight Danny Martinez at UFC Fight Night 43. In Jorgensen’s defense, last month’s submission defeat to Jussier da Silva came in controversial fashion. Da Silva was able to slap on a rear-naked choke when he appeared to drop “Young Guns” with an accidental headbutt. The Comissao Atletica Brasileira de MMA, who oversaw the event, denied Jorgensen’s appeal to have the loss overturned. Martinez is looking to bounce back from a unanimous decision defeat to Chris Cariaso in his UFC debut. He had rattled off four straight wins to earn a crack in the big leagues. The June 7 event takes place inside Tingley Coliseum in Albuquerque, New Mexico.